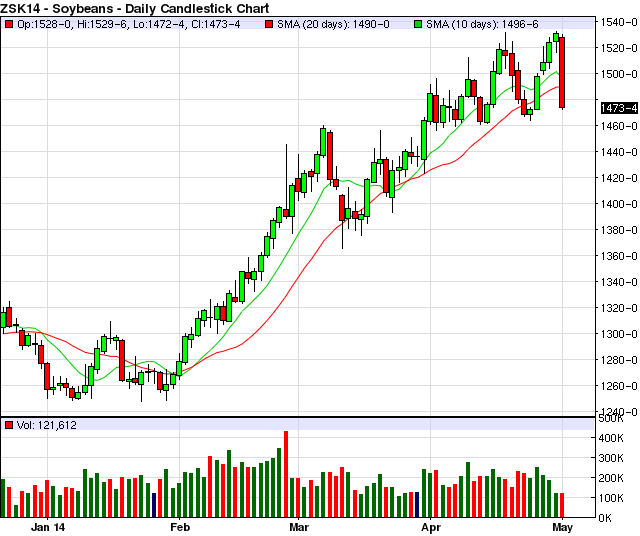 The Month of May sure started out with a bang as July soybeans were down over 50 cents only one day into the month. This is the largest one-day move in soybeans so far this year and it was to the downside. What does this mean for soybeans going forward? 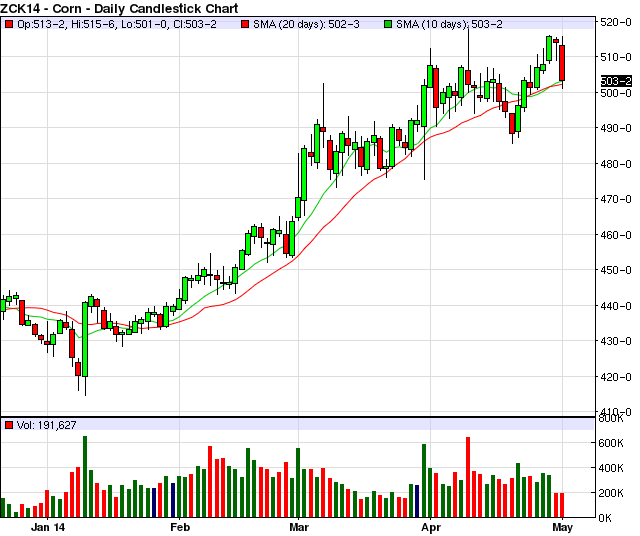 July soybeans posted an new high close for the year on Tuesday at $15.20 1/2. For the last few months soybeans have been on a mission to price ration demand for fears of running out of soybeans this year. A record pace of export sales, a stronger then expected domestic crush and a lack of Chinese cancellations have fueled the $2.80 cent rally off of lows. Currently the USDA is projecting a very tight 135 million bushel soybean carryover but some feel that final soybean carry over could be closer to 110 million bushels due to stronger then expected crush and export shipments numbers. Currently the USDA has exports pegged at 1.580 billion bushels and total commitments are at 1.638 billion. If we were to ship the total commitments we have on the books we would be 58 million bushels above the USDA estimate and this could severely cut into the 135 million bushel carry over number. 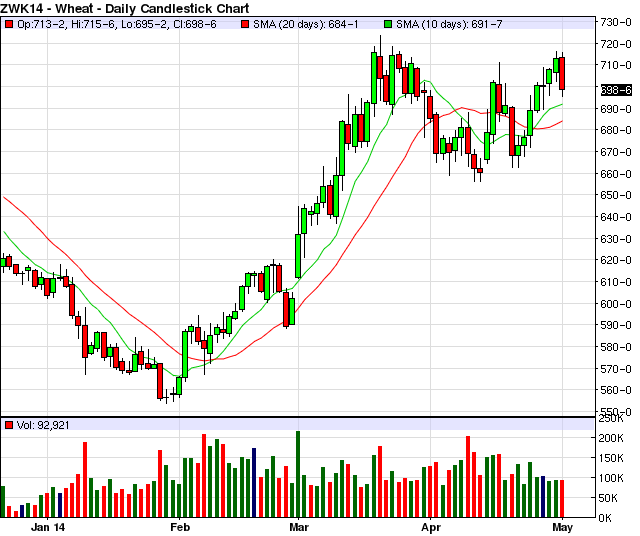 However, soybeans were very heavy to start the month of May. This came from a negative export sales number and talk that more South American soybeans were on the way to the US. Export sales were negative for the first time this year. The trade had been watching closely for Chinese cancellations and a negative export sales number for some time but it hasn't come - until this week. The negative .6 million bushel soybean sales number is a long way from the reduction in sales we need to see to get back to the current USDA estimate. However, export sales have slowed to next to nothing in the last few weeks and this negative sales number this week could be an indication that more reductions are on the way. There has also been lots of talk in the last two days of South American soybeans headed to the US. Two weeks ago newswires confirmed that there were 2 panamaxes of South American soybeans that had been canceled by China and were on their way to the US. In the last two days the talk has been that there is now an additional 10 on the way. In the mean time cash bids at the Gulf and in South America dropped sharply. This is fueling talk that US imports of South American soybeans may be higher, even much higher then the current USDA estimate. The USDA is already expecting a record amount of US imports this year but some people think actual imports may be twice as much as current USDA estimates. This would take a significant amount of pressure off the tight US balance sheet and may end the need for price rationing soybeans.